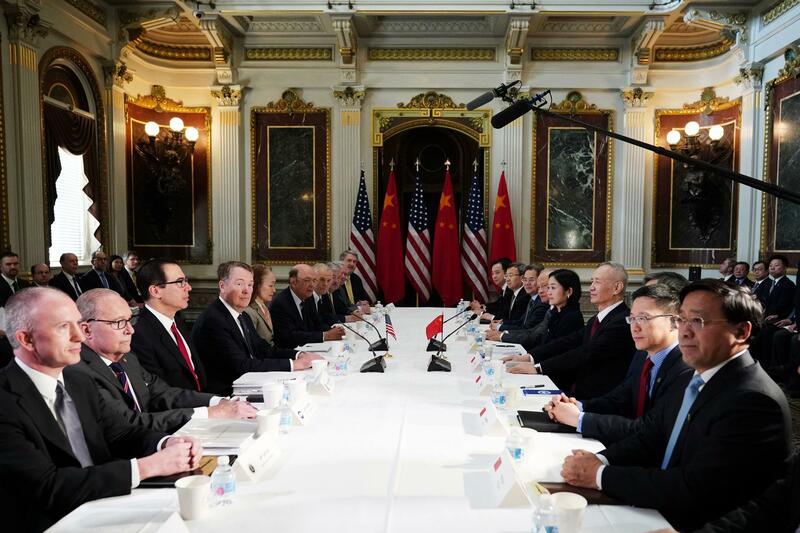 U.S. and Chinese trade negotiators meeting in Washington, D.C. last week. Citing progress in the talks, President Trump said he would suspend a planning increase in tariffs on Chinese goods due to take effect on March 1. Trump tweeted that the two sides had made "substantial progress" on structural issues, including protection of intellectual property and an end to the forced transfer of U.S. technology. The president hopes to finalize a deal during a face-to-face meeting with Chinese President Xi Jinping at Trump's Florida vacation home. "Assuming both sides make additional progress, we will be planning a Summit for President Xi and myself, at Mar-a-Lago, to conclude an agreement," Trump wrote, celebrating what he called "a very good weekend for U.S. & China!" Trade talks were initially expected to wrap up Friday but had been extended through the weekend in a sign of positive momentum. Negotiators cautioned, however, that a final deal was still uncertain. "It's a little early for Champagne," Commerce Secretary Wilbur Ross said Friday. U.S. businesses will welcome the decision to delay higher tariffs. Even at the existing, 10 percent rate, Trump's China duties are costing American businesses and consumers upwards of $2 billion per month.